Significantly expanded from the German textbook. Transportation Research Part B 117, 613-623. 6th International Conference on Self-Adaptive and Self-ordering Systems, September 14 2012 at Lyon, France. Spektrum der Wissenschaft, Oktober 2011. Transportation Research Part B: Methodological 44(8-9), 983-1000 (2010). 13th International IEEE Conference on Intelligent Transportation Systems - ITSC 2010, September 19 - 22 2010 at Madeira Island, Portugal. Traffic and Granular Flow '09, Springer. Traffic and Granular Flow '09, Springer (2009). The European Physical Journal B 69, 583-598 (2009), DOI: 10.1140/epjb/e2009-00140-5 (2009). European Physical Journal B, Vol. 8, No. 4, pp.607-618. DOI 10.1140/epjb/e2009-00121-8. in "Multi-Agent Systems: Simulation and Applications", Chapter 11, Pages 325-356. Editors A. Uhrmacher and D. Weyns, published by CRC, 2009, ISBN 978-1420070231.
in "Handbook on Vehicular Networks", Chapter 2 (29 pages). Editors M. Weigle and S. Olariu, published by Chapman & Hall/CRC, 2009, ISBN 978-1420085884.
mobilTUM 2009 - International Scientific Conference on Mobility and Transport, Munich (2009). published in pp 117-128 of Traffic and Granular Flow '07, Springer (Berlin), DOI: 10.1007/978-3-540-77074-9_10. published in pp 413-419 of Traffic and Granular Flow '07, Springer (Berlin), DOI: 10.1007/978-3-540-77074-9_10. 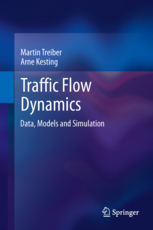 published in pp 211-221 of Traffic and Granular Flow '07, Springer (Berlin), DOI: 10.1007/978-3-540-77074-9_10. Physical Review E 78, 036102 (2008). Transportation Research Part C: Emerging Technologies, Volume 16, Issue 6, Pages 668-683 (2008). See also the newspaper article Schlau gegen Stau in the Financial Times Deutschland, November 27, 2006. Transportation Research Record, Volume 2088, Pages 148-156 (2008). DOI: 10.3141/2088-16. Transportation Research Record, Volume 2088, Pages 90-101 (2008). DOI: 10.3141/2088-10. Transportation Research Record, Volume 2088, Pages 208-217 (2008). DOI: 10.3141/2088-22. Computer-Aided Civil and Infrastructure Engineering, Volume 23, Issue 2, Pages 125-137 (2008). DOI: 10.1111/j.1467-8667.2007.00529.x. In: Networks for Mobility. Proceedings of the 4th International Symposium, Stuttgart. Eds. U. Martin et al., ISBN: 978-3-921882-24-5. In: Networks for Mobility. Proceedings of the 4th International Symposium, Stuttgart. Eds. U. Martin et al., ISBN: 978-3-921882-24-5, 2008. Presentation No. 08-2715 at the Annual Meeting of the Transportation Research Board, January 13-17, 2008, Washington, DC. Transportation Research Record: Journal of the Transportation Research Board, Volume 2000/2007, pp. 16-24. DOI 10.3141/2000-03. Transportation Research Record: Journal of the Transportation Research Board, Volume 1999/2007, pp. 3-12. DOI 10.3141/1999-01. Transportation Research Record: Journal of the Transportation Research Board, Volume 1999/2007, pp. 86-94. DOI 10.3141/1999-10. Transportation Research Record: Journal of the Transportation Research Board, Volume 1999/2007, pp. 23-29. DOI 10.3141/1999-03. Managing Complexity. Insights, Concepts, Applications (Understanding Complex Systems), Editor Dirk Helbing. Springer, 2007, ISBN 978-3540752608. Presentation at the 1st open Workshop on Simulation of the Car2Car Communication Consortium and the COMeSafety project (29 March 2007) [PDF]. Coupled vehicle and information flows: message transport on a dynamic vehicle network. Physica A, Volume 363, Issue 1, Pages 73-8. Phys. Rev. E 74, 016123, doi: 10.1103/PhysRevE.74.016123. Delays, inaccuracies, and anticipation in microscopic traffic models. Physica A 360, 71-88. DOI 10.1016/j.physa.2005.05.001. Understanding arrival and departure time statistics from interactions in queuing systems. Physica A, Volume 363, Issue 1, Pages 62-72 doi:10.1016/j.physa.2006.01.048. Traffic and Granular Flow '05, Springer (Berlin), p. 633-643. Traffic and Granular Flow '05, Springer (Berlin), p. 645-655. Analytical investigation of oscillations in intersecting flows of pedestrian and vehicle traffic. Phys. Rev. E 72, 046130. Analytical investigation of innovation dynamics consideriung stochasticity in the evaluation of fitness. in: U. Stopka, W. Pällmann (Hrsg.) Für eine neue deutsche Verkehrspolitik (Edition Internationales Verkehrswesen, Deutscher Verkehrs-Verlag, 2005), pp 76-85 ISBN 3-87154-335-7. Visualisierung der fahrzeugbezogenen und verkehrlichen Dynamik mit und ohne Beeinflussungs-Systeme. Memory effects in microscopic traffic models and wide scattering in flow-density data. Phys. Rev. E 68, 067101. An adaptive smoothing method for traffic state identification from incomplete information. pp 343-360 in: H. Emmerich, B. Nestler, and M. Schreckenberg (eds.) Interface and Transport Dynamics. Computational Modelling (Springer, Berlin). Cooper@tive Tr@nsport@tion Dyn@mics 1 2.1-2.24.
Cooper@tive Tr@nsport@tion Dyn@mics 1 3.1-3.24. Modelling widely scattered states in 'synchronized' traffic flow and possible relevance for stock market dynamics. Micro- and Macrosimulation of Freeway Traffic. Mathematical and Computer Modelling 35(5/6), 517-547. Contribution to the 16. Symposium "Simulationstechnik ASIM 2002" Rostock, 10.09 -13.09.2002, edited by Djamshid Tavangarian and Rolf Grützner pp. 514--520.
in M. Fukui, Y. Sugiyama, M. Schreckenberg, and D.E. Wolf (eds.) Traffic and Granular Flow '01 (Springer, Berlin), pp. 511-530. Microsimulations of freeway traffic including control measures. MASTER: Macroscopic traffic simulation based on a gas-kinetic, non-local traffic model. Transportation Research B 35, 183-211. Congested Traffic States in Empirical Observations and Microscopic Simulations. Phys. Rev. E 62, 1805-1824. Microscopic Simulation of Congested Traffic. in: ``Traffic and Granular Flow '99'', edited by D. Helbing, H.J. Herrmann, M. Schreckenberg, and D.E. Wolf (Springer, Berlin), pp 365-376. Macroscopic Simulations of Open Systems and Micro-Macro Link. in: ``Traffic and Granular Flow '99'', edited by D. Helbing, H.J. Herrmann, M. Schreckenberg, and D.E. Wolf (Springer, Berlin, 2000), pp 383-388. Phys. Rev. E 59, 239-253. Phys. Rev. Lett. 82, 4360-4363. J. Phys. A: Math. Gen. 32, L17-L23. Numerical Simulation of Macroscopic Traffic Equations Computing in Science and Engineering (CiSE) 5, 89 (1999). Phys. Rev. Lett. 81, 3042-3045. VDI-Berichte zur 22. VDI/VW Gemeinschaftstagung: Integrierte Sicherheit und Fahrerassistenzsysteme, ed. M. Lienkamp. Wolfsburg, October 2006. ISBN 3-18-091960-4. 17th International Conference on the Application of Computer Science and Mathematics in Architecture and Civil Engineering, IKM 2006 K. Gürlebeck and C. Könke (eds.) Weimar, Germany, CD-ROM edition. Influence of reaction times and anticipation on the stability of vehicular traffic flow. Contribution to the Sixth IFAC Workshop on Time-Delay Systems, L'Aquila, Italy, CD-ROM (2006). Fokker-Planck equation approach to vehicle statistics. in Traffic Flow, preprint cond-mat/9901239 (1999). M. Treiber and L. Kramer, Coupled complex Ginzburg-Landau equations for the weak electrolyte model of electroconvection, Phys. Rev. E 58, 1973 (1998). M. Treiber, N. Eber, A. Buka und L. Kramer, Travelling waves in electroconvection of the nematic Phase 5: a test of the weak electrolyte model. J. Phys II France 7, 649 (1997). M. Treiber, Analytic expressions for the stochastic amplitude equation in Taylor-Couette flow, Phys. Rev. E 53, 577 (1996). M. Dennin, M. Treiber, L. Kramer, G. Ahlers und D. Cannell, Origin of travelling rolls in electroconvection of nematic liquid crystals, Phys. Rev. Lett. 76, 319-322 (1996). M. Treiber, Thermal fluctuations in pattern forming instabilities, in L. Kramer und A. Buka, editors, Pattern Formation in Liquid Crystals, Springer, (NY 1996). M. Treiber und L. Kramer, Bipolar electrodiffusion model for electroconvection in nematics, Mol. Cryst. Liq. Cryst 261, 311 (1995). M. Treiber und L. Kramer, Stochastic envelope equations for nonequilibrium transitions und application to thermal fluctuations in electroconvection in nematic liquid crystals, Phys. Rev. E 49, 3184 (1994). H. Treiber und M. Treiber, Lasertechnik 2 / Holographie, Frech-Verlag, ISBN 2-7724-5410-0 (1988). L. P. Mannschke, M. Treiber und A. Kunz, Simulation of components for waveguide insulators using anisotropic 3D-BPM, Proceedings of the 5. European Conference on Integrated Optics, Society of Photo-Optical Instrumentation Engineers (SPIE) Conference Series 1141, pp. 74 (1989). G. Loos und M. Treiber, Optimierungsmethoden für optische Reflektoren, Optik 80, No. 1, 33 (1988). M. Treiber, On the Theory of the Electrohydrodynamic Instability in Nematic Liquid Crystals near Onset , Phd dissertation (in English), University of Bayreuth, 1996. M. Treiber, Einfluss von Fluktuationen auf feldgetriebene Übergänge in Flüssigkristallen, Diploma thesis, University of Bayreuth, 1991. M. Treiber, Optimierungsmethoden für optische Reflektoren, Diploma thesis, University of Bayreuth, 1987. The material presented on this page is presented to ensure timely dissemination of scientific work. Copyright and all rights therein are retained by authors or by other copyright holders. All persons copying this information are expected to adhere to the terms and constraints invoked by each author's copyright. These works may not be reposted without the explicit permission of the copyright holder.